The policies offered by the National Insurance Company Limited for motorcycle are very much in demand in India. National two wheeler insurance has its specific importance in terms of providing exclusive and unique services. To talk about the portfolio of NICL, it's the oldest non life general insurance company in India and the only Public Sector General Insurance Company to pioneer product customization for both Rural and Corporate Insurance plans. Just as other types of motor insurance plans, National two wheeler insurance policies come with both third party and comprehensive coverage. It doesn't matter what types of policy you choose for your bike, National two wheeler insurance policies can be purchased or renewed online directly through the company's official online portal. Being the oldest general insurance company in India, two wheeler policies by the National Insurance Company Limited, stand poles apart in terms of the benefits that are being offered. Here are some of the unique features and benefits that you can avail by opting for National bike insurance policy. √National two wheeler insurance policy comes with low cost and tailor-made plans that offer widespread coverage options. √Attractive add-on covers can be opted for with additional premium payment. √Provides Easy, quick and transparent claim settlement process. √Policy holders can easily track their claim status online. √National bike insurance online policy is available with both short and long term coverage options. You are most likely to gain extra advantages if you buy National bike insurance policy with long term cover. √Discounts such as the provision of No Claim Bonus against each claim free year. This discount is applicable on the National two wheeler insurance policy renewal. √Easy transfer of an existing No Claim Bonus from any other insurance provider. √Easy and instant cashless claim service is provided. √You can instantly buy or renew National two wheeler insurance policy online without any hassle. What Types of Coverage Available Under National Two Wheeler Insurance Policy? The National Insurance Company Limited generally offers two types of covers under their two wheeler insurance plan: Third Party and Comprehensive. Third Party Liability Cover: This plan protects you against any legal liability due to an accident involving your vehicle. This liability only plan does not cover any damage to your own vehicle. This plan covers the following risks. Package or Comprehensive Cover: This is a comprehensive National two wheeler insurance plan that covers both third party liability and the damages done to your own vehicle as well. 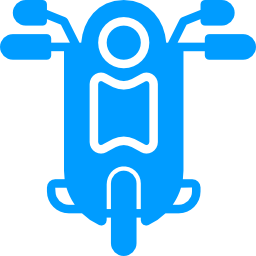 Furthermore, this package plan covers the rider-driver and the co-passenger against accidents. This plan covers the following risks. √This plan covers Accident by External Means such as Fire, Self Ignition, Explosion, Lightning. √Secures your vehicle against Burglary, Theft or House breaking. √Covers the damages due to transit by Rail, Road, Air, Life, Inland Waterway etc. √Protection against various Manmade Calamities such as Riots, Terrorist Acts, Strikes or any other Malicious Acts. √Covers damages against various Natural Calamities such as Flood, Earthquake, Storm, Rockslide, Landslide etc. Just as simply you can buy National two wheeler Insurance online, you can likewise perform the National two wheeler insurance renewal procedure without any hassle in India. National bike insurance policy renewal will hardly take a few minutes from your busy schedule when you do it online. It's very much important to renew your National bike insurance online before your existing policy expires. You will cease to get the protection on your motorcycle and you may also lose you NCB if you forget about National bike insurance policy renewal on time. Below are the steps to renew your National bike insurance online in India. √Simply visit the official online portal of National Insurance Company (NIC) for instant National insurance two wheeler policy renewal. √Choose 'Motorcycle Insurance' under 'Motor Insurance' tab and click on 'Renew' option to initiate your National two wheeler insurance renewal process. √Thereafter, enter your policy number and click on 'Renew Policy' for instant National two wheeler insurance renewal online. √In the next step, you will be diverted to the premium payment page. Pay the premium digitally for the successful completion of your national two wheeler insurance renewal online. √After you have made the payment online, you will receive a confirmation mail in your registered mail id. You can also download and save your National two wheeler insurance renewal details for future use. What Are The Exclusions Under National Two Wheeler Insurance? Buying National two wheeler Insurance online doesn't mean you will get protection under all circumstances and conditions. Just like various other motor insurance policies in India, National two wheeler insurance also have some exclusions. √Consequential loss, wear and tear, electrical or mechanical breakdown, malfunctions or failures of your bike. √Any accidental injury, damage or loss suffered while the insured or any other person driving the vehicle with the knowledge and permission of the insured is under the influence of alcohol or drugs etc. √Any damage to the tyres if the motor vehicle is not damaged at the same time. In such cases the liability of the insurer is restricted to 50% of the total cost of replacement. √Expenses of part/s and related labour, breakdown of which led to any accident are excluded. National Insurance Company has the best two wheeler insurance plans on offer for all people owing bikes in India. NIC lets their policy holders buy or renew National bike insurance online instantly through their online portal. The company also holds a good reputation in terms of providing the best yet effective customer care solutions regarding motor insurance services. National bike insurance online come with the best yet affordable quotes that can be availed without having any financial trouble. 1. Why is it compulsory to opt for car/bike insurance? As per Indian Motor Vehicles Act, 1988, it is mandated that all the vehicles must have at least third party insurance. Without third party insurance, any owner of a car or bike can't drive their vehicle on road. Hence it is compulsory to opt for car/bike insurance since you can't escape from the law. 2. Can I make a third-party insurance for my new bike? Of course you can and let me tell you, you will have to make at least a third party insurance for your bike, since third party insurance is compulsory to have for all vehicles, be it a bike or a car or a lorry. 3. Can I renew my bike insurance 1 month before the due date? Yes, you can renew your bike insurance 1 month before the due date. Since you have purchased bike insurance, it can be renewed anytime within your policy period. 4. How can I insure my bike without having my old insurance copy? If you don't have your old insurance copy, it means you can't renew the bike insurance policy. But it's not really an issue since your goal is to insure your bike. You can purchase a new bike insurance policy in order to insure your bike. Previous insurance copy is not a prerequisite to have insurance for your bike. 5. Does bike insurance covers plastic spare parts? As per two-wheeler insurance policy in India, a depreciation of 50% is applicable for all plastic parts of your bike. This means your comprehensive bike insurance will cover 50% of your bike's plastic spare parts.